Thanks for the recipe, Grace Byers! In a small bowl, add poultry seasoning, onion powder, garlic powder, Caribbean curry powder, and raw sugar. Stir to combine and set aside. On a clean workspace, pat chicken dry with paper towels and transfer to a large bowl. Add prepared seasoning mixture, season with salt and pepper, and toss to coat. Cover and transfer to refrigerator and allow to marinate overnight. Remove chicken from refrigerator 30 minutes before cooking and allow to come to room temperature. Set aside. Meanwhile, in a medium Dutch oven, over medium heat, warm olive oil. Add 2 sprigs of thyme, 1/2 of the onion, 1/2 of the green onions, and 3 cloves of garlic. Stirring occasionally, cook until mixture has softened and become fragrant, about 2-3 minutes. To the same Dutch oven, add chicken and stir to combine. Cover and cook to allow juices to form, for about 5-8 minutes. Uncover and add habanero. Add carrots, potatoes, and remaining onion, green onions, garlic and thyme. Stir to combine, and add additional curry powder to taste. Gently lift and fold mixture over itself and add 2-3 cups boiling water, to come halfway up the sides. Stir to combine and cover. Cook for 15 minutes and then turn down to a simmer for 5 minutes. 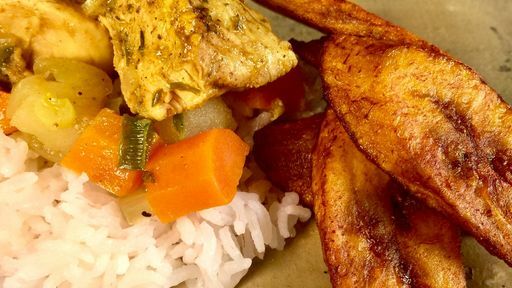 Serve with white rice and fried plantains. In a large bowl combine the water, salt and plantains. Allow to soak for 30 minutes. Drain and pat dry with a paper towel. Line a plate with paper towels. Preheat 1 inch of vegetable oil in a Dutch oven to 360ºF. Add plantains and allow to fry until golden brown and tender, about 3 to 4 minutes. Remove to paper towel-lined plate and season with salt. Tip: For a tasty twist, try this dish with shrimp instead of chicken!